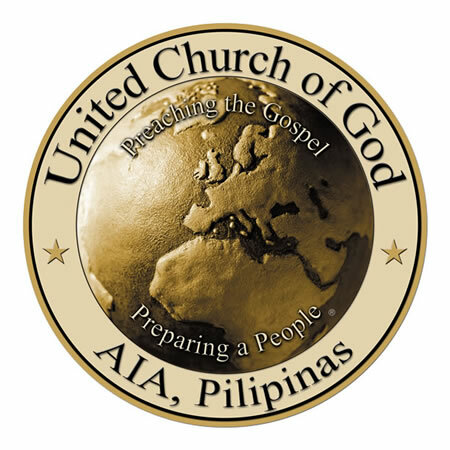 The following are statements regarding the fundamental beliefs of the United Church of God, an International Association. 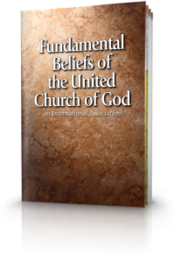 This is not intended to be a comprehensive statement of the beliefs of the Church. Questions about doctrine and belief will be addressed by a process adopted by the Council of Elders (Council) and approved by the General Conference of Elders (General Conference). We believe that Scripture, both the Old and the New Testament, is God's revelation, and His complete, expressed will to humanity. Scripture is inspired in thought and word, infallible in the original writings, is the supreme and final authority in faith and in life, and is the foundation of all truth. We believe that sin is the transgression of the law. The law is spiritual, perfect, holy, just and good. The law defines God's love and is based upon the two great principles of love toward God and love toward neighbor, and is immutable and binding. The Ten Commandments are the ten points of God's law of love. We believe that breaking any one point of the law brings upon a person the penalty of sin. We believe that this fundamental spiritual law reveals the only way to true life and the only possible way of happiness, peace and joy. All unhappiness, misery, anguish and woe have come from transgressing God's law. We believe God so loved this world of helpless sinners that He gave His only begotten Son, who, though in all points tempted as we are, lived without sin in the human flesh. That Son, Jesus Christ, died as a sacrifice for the sins of humanity. His life, because He is the Creator of all humanity, is of greater value than the sum total of all human life. His death is, therefore, sufficient to pay the penalty for every human being's sins. In paying this penalty He has made it possible, according to God's plan, for each person and humanity as a whole to have their sins forgiven and to be released from the death penalty. We believe that all who truly repent of their sins in full surrender and willing obedience to God, and who by faith accept Jesus Christ as their personal Savior, have their sins forgiven by an act of divine grace. Such individuals are justified, pardoned from the penalty of sin, and receive the gift of the Holy Spirit, which literally abides within them and supplies the divine love that alone can fulfill the law and produce righteousness. They are baptized by the Spirit into the body of Christ, which is the true Church of God. We believe in a true change in life and attitude. Only those who have the indwelling presence of and are being led by the Holy Spirit are Christ's. We believe in the commanded observance of the seven annual Holy Days given to ancient Israel by God and kept by Jesus Christ, the apostles and the New Testament Church. These Holy Days reveal God's plan of salvation. We believe that those meats that are designated "unclean" by God in Leviticus 11 and Deuteronomy 14 are not to be eaten. We believe in God's enduring righteousness. That righteousness is demonstrated by God's faithfulness in fulfilling all of the promises He made to the father of the faithful, Abraham. As promised, God multiplied Abraham's lineal descendants so that Abraham literally became the "father" of many nations. We believe that God, as promised, materially prospered Abraham's lineal descendants Isaac and Jacob (whose name He later changed to Israel). We believe that God, through Abraham's Seed, Jesus Christ, is making salvation available to all humanity regardless of their physical lineage. Salvation is not therefore a right of birth. It is freely open to all whom God calls, and those who are regarded as descendants of Abraham are those of the faith, heirs according to the promises. We believe that the knowledge that God has fulfilled and continues to fulfill the physical promises made to Abraham and his children, and is fulfilling the spiritual promise through Jesus Christ, is critical to understanding the message of the prophets and its application to the world in which we live. We believe God's purpose for mankind is to prepare those whom He calls, and who elect through a life of overcoming sin, developing righteous character, and growing in grace and knowledge, to possess the Kingdom and to become kings and priests reigning with Christ on this earth after His return. We believe that the reason for mankind's existence is literally to be born as spirit beings into the family of God. We believe that the Church is that body of believers who have received, and are being led by, the Holy Spirit. The true Church of God is a spiritual organism. Its biblical name is "The Church of God." We believe that the mission of the Church is to preach the gospel (good news) of the coming Kingdom of God to all nations as a witness, and to help reconcile to God such people as are now being called. We believe that it is also the mission of the Church of God to strengthen, edify and nurture the children of God in the love and admonition of our Lord Jesus Christ. We believe that the only hope of eternal life for mortal humans lies in the resurrection through the indwelling of the Holy Spirit. We believe that at the return of Jesus Christ a resurrection to spirit life will take place for all who have been God's faithful servants. We believe that after Jesus Christ has ruled on this earth for 1,000 years, there will be a resurrection to physical life of the vast majority of all people who have ever lived. We believe that after these people have had an opportunity to live a physical life, if they become converted, they too will receive eternal life. We also believe that those who reject God's offer of salvation will reap eternal death.